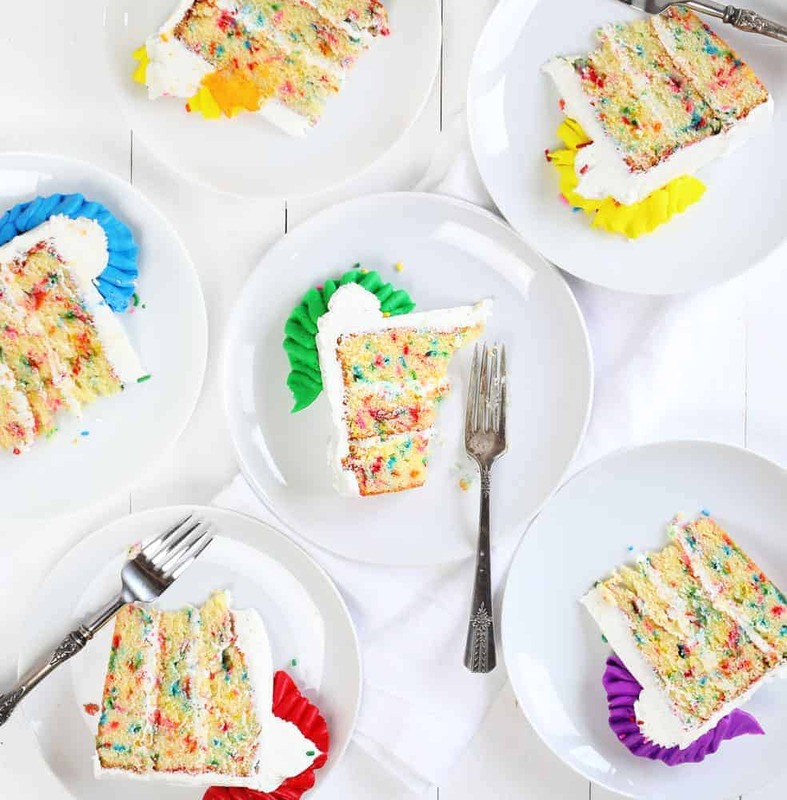 This Delicious Sprinkles Cake Is Always a Crowd Pleaser. The Perfect Birthday Cake For Someone You Love! If you love celebrations cakes, don’t miss my Best Chocolate Cake Recipe or these Cake Decorating Ideas. If you are looking for a delicious and FUN cake to make this is it! 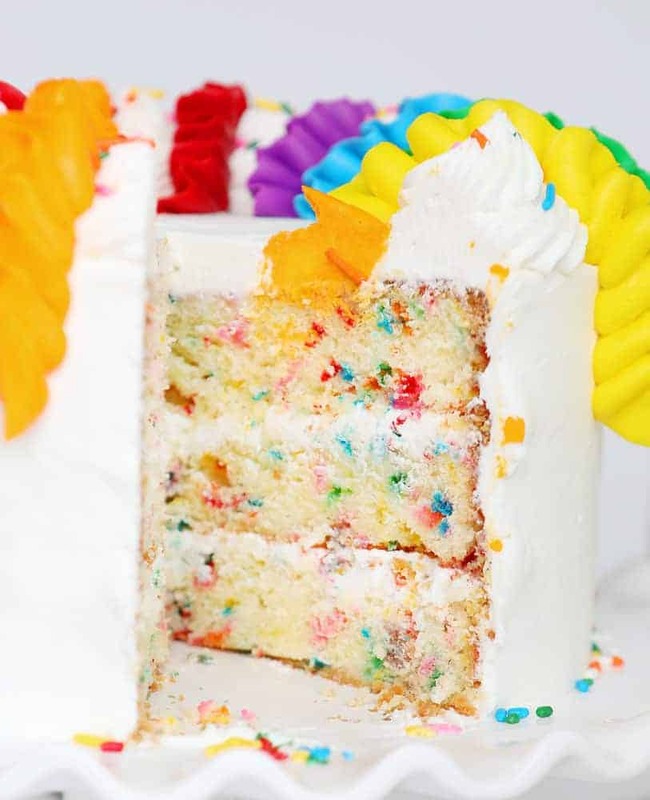 This sprinkles cake recipe is a big cake, 3 full layers, that packs a big flavor punch! 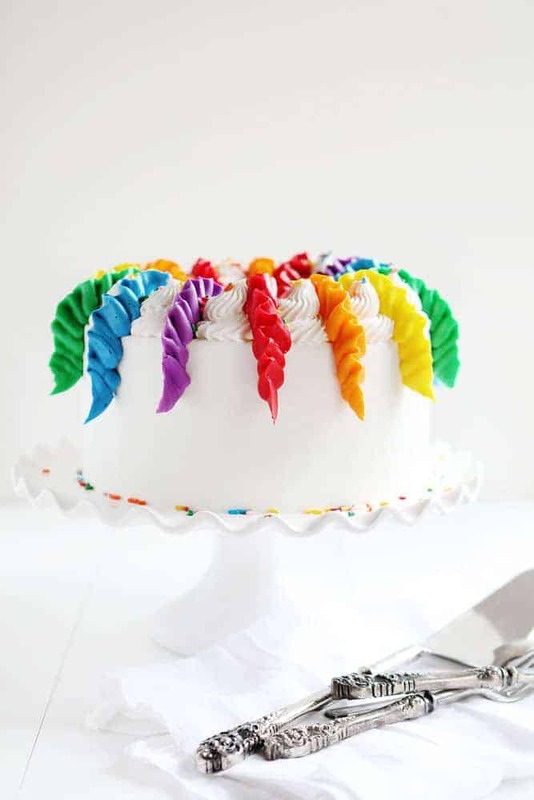 I love to pair it with a vanilla buttercream and add a few rainbow frosting ribbons. I happen to think this decorating technique is perfect for a birthday cake! 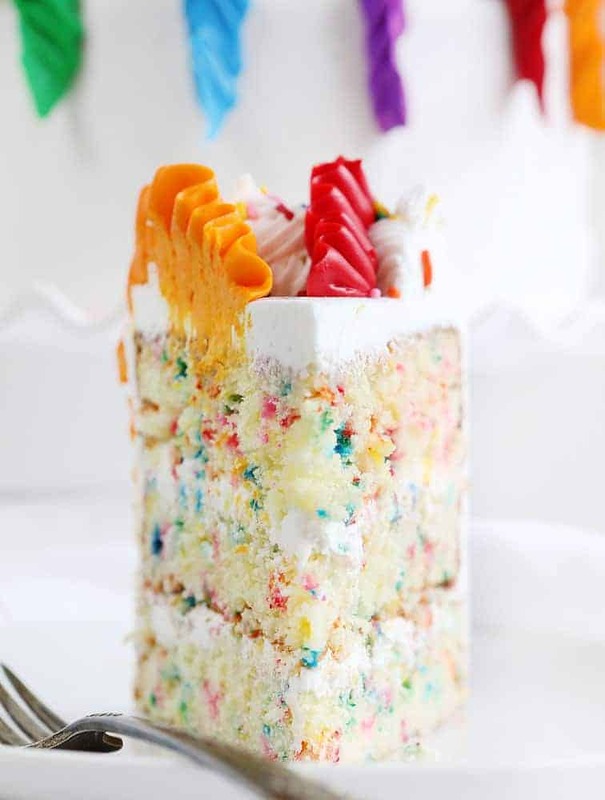 Top with a few more rainbow jimmies and you have the happiest cake on earth. Start by covering the cake in a crumb coat of frosting. Allow cake to set for at least 15 minutes, then apply a smooth coat of frosting over top. Smooth it out with a small offset spatula or bench scraper. Now add some frosting to a bag fitted with a 9FT tip. Pipe swirls around the edge of the cake. To make the “ribbons” of frosting over the sides I used a #126 tip which is a large teardrop tip. (You can also use a #104 tip, which is just a smaller version.) Starting at the top of the cake at the inside edge of the dollops, apply pressure and move up and over and in between the dollops. Move your top over and down the top side of the cake then release pressure at about halfway down the side of the cake. If you happen to only have one #126 tip like I did, you may want to plan ahead. I piped my first ribbon in red then counted out to where the next red ribbon would be and piped another. Then I washed the tip and repeated with orange. Then washed the tip and repeated with the remaining colors. This has been one of the most popular birthday cakes I have ever made. The kids request it often (I have 5 kids so there are plenty of opportunities to make it!) and are also so happy when I bring it out. 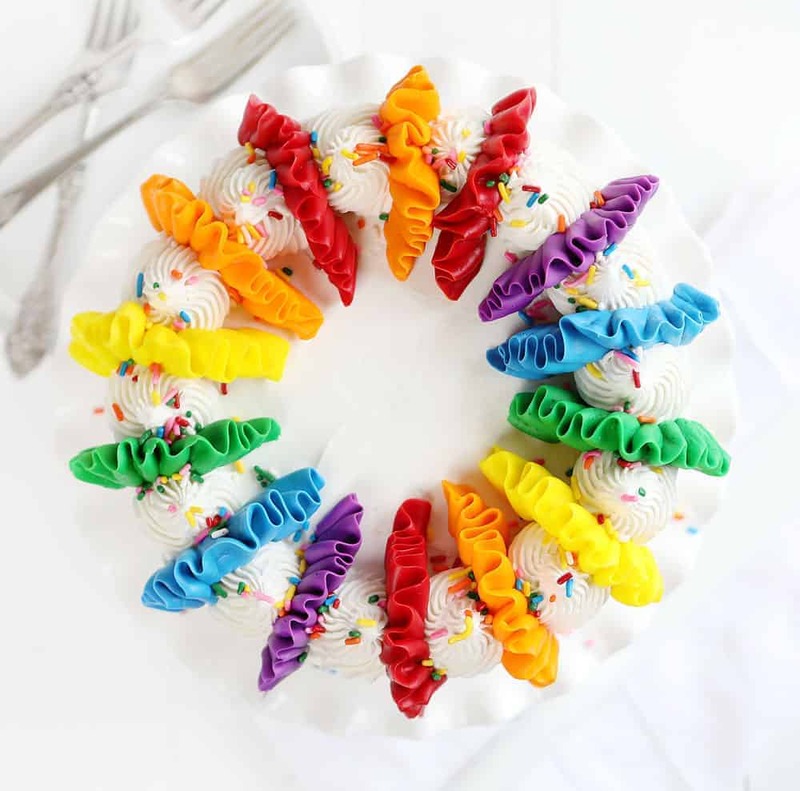 You can customize the cake decorating in so many ways, but another popular version is the sprinkles cake. You can also make this Sprinkles Cake with chocolate frosting, just like my little Eddie likes it! -Preparing the pans ahead of time. Make sure you line them with parchment paper as the sprinkles can stick to the bottom and make the cake hard to remove. -Use room temperature ingredients. When the butter, eggs, and milk are room temperature they incorporate better into the batter and help to create the most perfect texture & crumb. 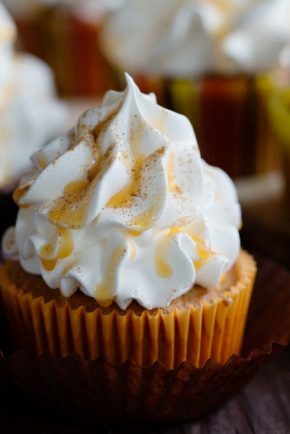 To make this recipe into cupcakes you will follow the recipe as written, but add the batter to a cupcake pan filled with liners. Fill each liner 3/4 full with the sprinkles cake batter and bake 16-22 minutes. You want the tops to rise and dome nicely. 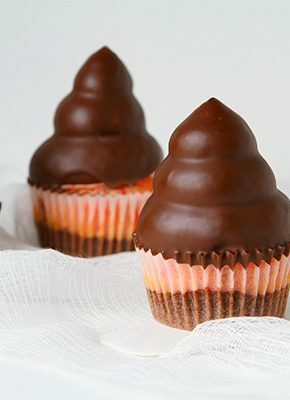 To test and see if they are done, insert a toothpick into the center of the cupcake. If it is removed mostly clean, they are done. 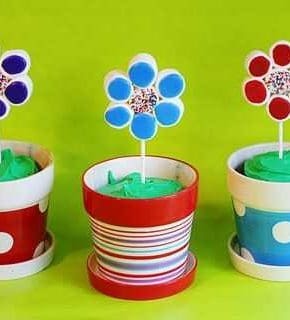 You do not want the wet batter to cling to the cupcake but a completely clean toothpick could mean the cupcakes are too done. You should have 24 cups or as many as 36 if you don’t fill them 3/4 full. In the bowl of a stand mixer fitted with the paddle attachment, cream together butter and shortening until light and fluffy, about 2 minutes. Stop and scrape sides as needed. Slowly add sugar and make sure ingredients are fully incorporated. Add eggs one at a time, making sure to fully incorporate each egg before adding another. Add in vanilla. Add flour mixture to butter and shortening mixture alternately with milk mixture, beginning and ending with dry ingredients. Remove bowl from stand mixer and stir in the rainbow jimmies by hand. Evenly distribute cake batter between cake pans (roughly 2 1/4 cups per pan) and place pans into oven. Bake for 25-30 minutes, or until a toothpick or cake tester inserted in the center comes out mostly clean. Cool in cake pans for about 10 minutes, then invert and cool completely on a wire rack. These cakes have a beautiful crust on top which is delicious, but if you are stacking the layers you may want to level each layer first. 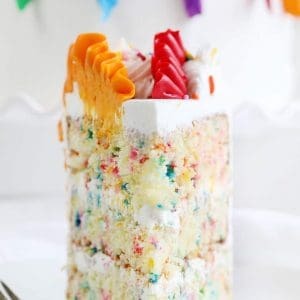 This Sprinkles Cake is the most delicious and wonderful cake! Not to mention the perfect Birthday Cake. dO YOU HAVE RECIPE FOR A ROSE GERANIEM CAKE . mY GRANDMOTHER MADE THIS CAKE FOR ALL OUR BIRTHDAYS ? Love you site and everything looks so tasty .My happy is the cook in our house as I’m disabled . He is a great cook and he likes to try different meals and I like seeing recipes on line for him to try . Looking at you chocolate cake can’t wait for him to make it . Love your recipes. Love baking, it’s kind of a hobby and that’s what I do whenever I have some free time. 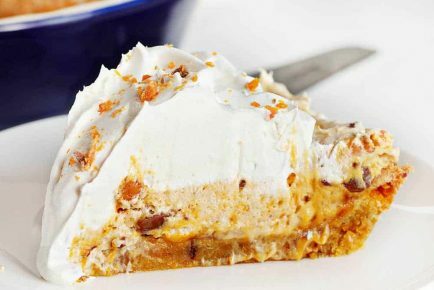 Will you be posting your Butter Cream Recipe? I did love this cake ! But I do have a question . As you stated it does have a major crust on the cake . I made cupcakes with some left over batter and they stuck really bad , to the wrapper . 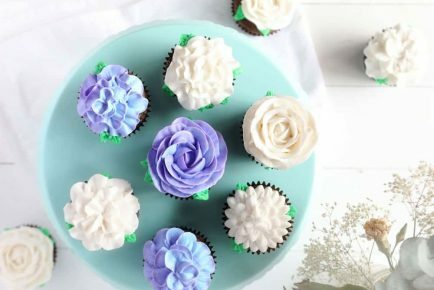 And the crust on the cake was really hard … what can I do differently with my cupcakes ? And how can I achieve less of a crust ? I’ve made this cake twice and both times the cake deflated. Major disappointment! Such a shame since it’s very tasty but I won’t be making this cake again. I attempted to make this recipe twice and both times the cakes deflated. They rose on the edges but never rose in the middle. Not sure what I am doing wrong. I love “I am baker. Hi just wanted to know what shortening is? Would you recommend trying this with browned butter? I definently want to make this for my daughter’s birthday but will like it for only a dozen cupcakes. 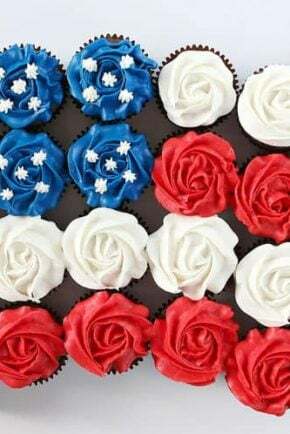 How can I make the recipe for only a dozen cupcakes?? Amo tu página y tus recetas, te sigo en todas tus páginas y disfruto horneando los pasteles de chocolate que muestras, me gustaría aprender hacer una crema blanca para pastel. Tienes alguna receta? Truly love your baking recipes. Add to me your regular subscribers please.. Thank You. Just wanted to know if I can make this cake without shortening? I live in India and we don’t get that here. You could use all butter.